It was late last year that Finfeed ran the ruler across 20 ASX listed oil and gas stocks that appeared to have the scope to either trade above their valuations at that time, or gain medium-term momentum on the back of positive news. One of those companies was Central Petroleum Ltd (ASX:CTP), an oil and gas explorer and conventional producer with a focus on supplying the Australian domestic gas market. At that stage the company was the largest onshore gas producer in the Northern Territory, and it still holds that position as the operator of the only producing onshore conventional gas fields, Mereenie, Palm Valley and Dingo. Central is in a position to pursue several reserve growth programs across what is regarded as the biggest package of proven and prospective oil and gas acreage that spans central Australia. We noted at the time that the Northern Gas Pipeline (NGP) is under development and remained on schedule for gas to flow to east coast markets from 2018, with 60 TJ/d of pipeline capacity available for new sales. 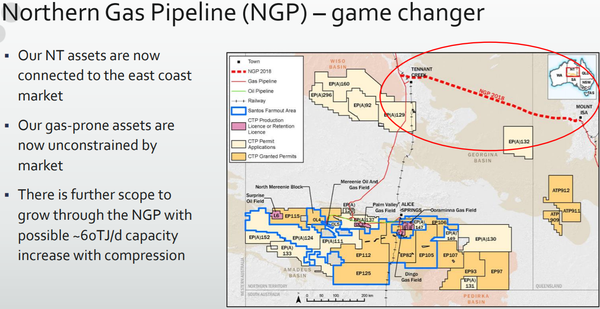 The NGP was in a sense the ‘last mile’ for Central Petroleum as it provided the link between Tennant Creek in the Northern Territory and Mount Isa in Queensland where there was an established pipeline to the east coast. At that stage, Central aimed to become a significant domestic energy player, having positioned itself to grow from current production of over 11 terajoules per day (TJ/d) of gas and 340 bopd (equity accounted). The pipeline was completed on time, and Central is now supplying gas to lucrative east coast markets, but it could be argued that the group’s progress and its future prospects aren’t captured in the company’s share price. 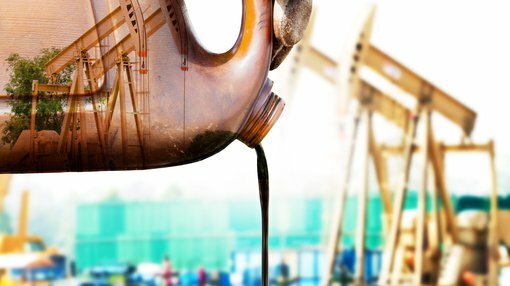 Morgans resources analyst, Adrian Prendergast, has just initiated coverage of Central Petroleum, placing an add recommendation on the stock with a target price of 21 cents. He expects the company to deliver a net profit of $24.3 million in fiscal 2020, representing earnings per share of 3.4 cents. This places the group on an attractive PE multiple of 3.8 relative to its current share price of 13 cents. Prendergast noted that following the commissioning of the NGP, Central Petroleum is selling the majority of its expanded gas volumes into the high-priced east coast market. As the company completes its gas acceleration program (GAP), the analyst expects the group’s share of installed gas sales capacity will increase from 14.9 terajoules per day to 41.4 terajoules per day as part of a phase I expansion of its Amadeus operations. There is the potential for Central Petroleum to increase its east coast sales with Prendergast saying that the NGP has current capacity of 90 terajoules per day, but could be expanded to 160 terajoules per day without compression. While the company doesn’t have the capacity to meet added demand at present, it has nearly 230,000 square kilometres of gas prone ground in the Northern Territory including the Dukas prospect which is under a free carry agreement with Santos (ASX:STO) as the operator. Central Petroleum has a 30% stake in this project, and exploration success at Dukas could be a game changer. Given the company’s revenue predictability, near-term profitability and highly prospective assets with access to lucrative markets, its share price of 13 cents, implying a market capitalisation of $92 million seems inconsistent with the group’s investment profile. Prendergast’s price target of 21 cents per share implies upside of approximately 60%, and it wouldn’t be surprising to see the company push up towards this level as it transitions to profitability in fiscal 2020.